God’s Blessings, We want them. I’ve never heard of someone who is open to the concept of God not wanting His best. If there is a creator of the universe and He walks with, provides for and resources His people for life, we want what He has to give. Success, prosperity, contentment all come to mind as things we would love to have added to our lives. With that, we want opportunities to grow, have an impact on others and make a difference in our little part of the world. Even believers in Christ are assured of their salvation but have a nagging suspicion that there might be things they are missing out on. So why are we limited in experiecing God’s blessings? Why aren’t all the opportunities open to us that might be? It’s like we’re living life on a short leash. This morning I was out walking my dog. 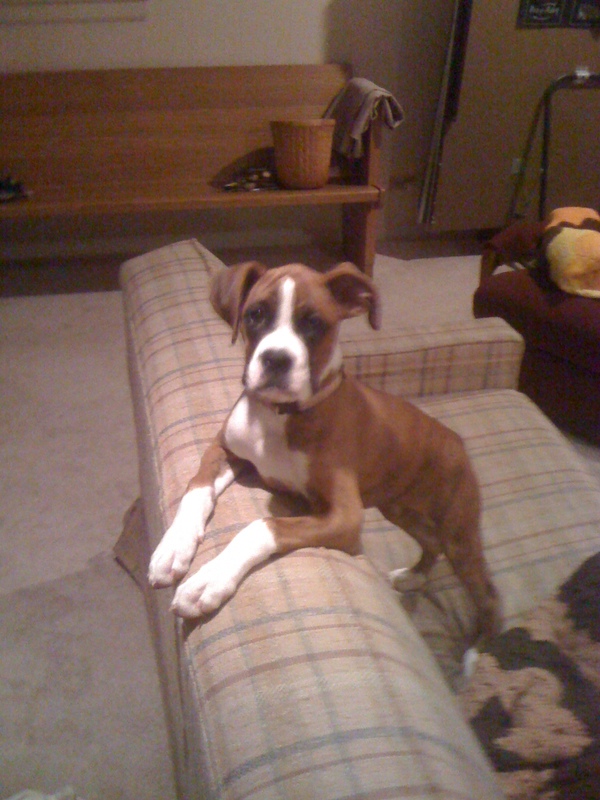 Little Bailie, a six month old boxer puppy is a handful. And walking her is both a leg and upper body workout! Actually it’s getting better. And is almost enjoyable. But let me tell you how I’ve done it. I bought a six foot leash. Now I know people who walk their dog with those 20 foot long extendable leashes, they don’t have boxers. In the middle of her six foot leash, is a loop that I tied in it. So actually she walks on a four foot leash. This keeps her pretty limited to walking at my side. But each day, during our walk, I decide to grab the top loop, giving her the whole 6 feet. Inevitably, she pulls more, strays more and slows our progress. And within about 20 feet I go to the short loop. I limit her freedom because she doesn’t know what to do with it yet. God has put some of us on a short leash because every time He’s given us some new opportunity or new responsibility, we’ve gotten distracted or we’ve shown ourselves irresponsible. And then we blame God because we don’t seem to get His best. Are you not sure about this? What did you do with the extra money you got the last time? What did you do with the extra off-hours? How did you treat the last new person God brought into your life? Getting Off the Short Leash. How do we get off the short leash? 1. Believe that God wants you to experience a full life. 2. Be honest about what you’re doing with what you’ve already been given. Is it all for you? Or are you accomplishing God’s purposes? 3. Create opportunities for self-discipline. Calendars, to-do lists, budgets all help us keep track of what we’re doing. 4. Reorder your current opportunities. Use what you have to live out God’s values and priorities. 5. Make a promise that the next time you get a little blessing, you will use it for something that puts a smile on God’s face (serving others, supporting a ministy, building a relationship). As we look into the new year, wouldn’t you like a little longer leash? Then keep your eyes on Him as you walk with Him. He will trust you with greater and greater blessings. Maybe you’ve heard the verse, “He who is faithful in little will be faithful in much.” God rarely gives much to one of his children who can’t handle little. ← 5 Warning Signs that You’re Wandering away from God.